Great for mirror and picture frames! 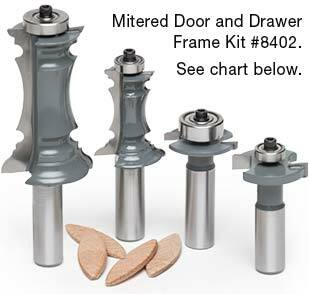 These versatile carbide tipped router bits create a dramatic door frame without complicated joinery. Great for mirror and picture frames, crown moldings, chair rails and other trim. 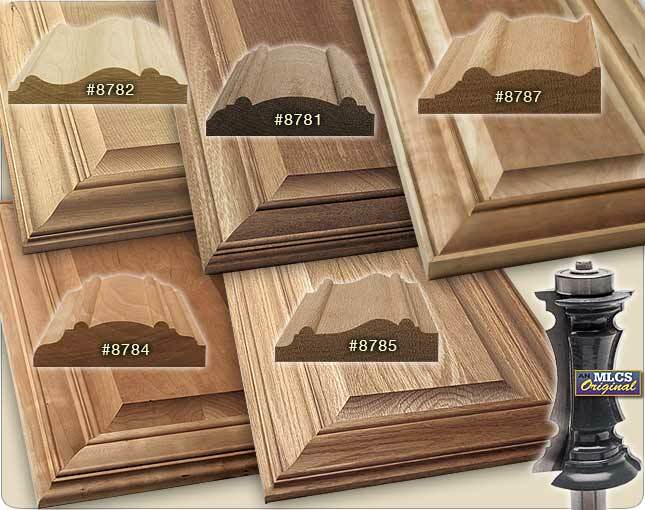 Combine with any raised panel router bit to create highly decorative raised panel doors that until now have only been available through high end cabinet shops. Use a 1/4" slot cutter to create the slot for the raised panel or a rabbeting bit to make glass panel doors, mirrors or picture frames. The stock is mitered at 45°, glued and biscuit joined to create a sturdy secure joint. These bits are designed to work with 2-13/16" wide stock and a recommended thickness of at least 3/4". For cup hinges, use 1" thick stock (minimum). Use in a 1/2" table mounted router only. 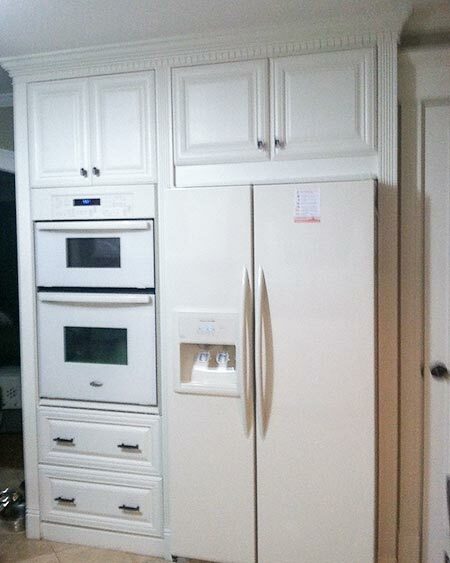 Click on the picture above to see an enlarged picture of the completed doors.See the Katana® version! 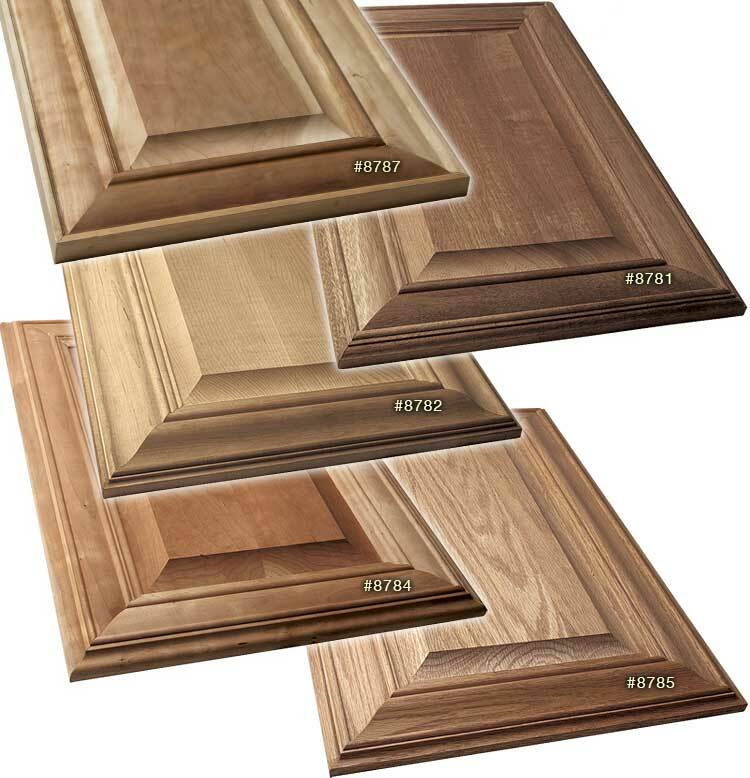 See Mitered Door Frame Complete Kits below. See a customer's kitchen made from our bits. Used the 8781/8788 to redo my master bathroom cabinet doors and drawers. Love the results. 1) If you use 1" stock for your frames as was my case, use 3/4" stock for the panels. Also, leave the panels 1/4" below the surface of the frames with a 1/4" cove - it will look so much better. 2) Use as many finger joints as possible while routing. This way you do not have to waste stock. 3) I made a special jig to go along with my 45 degree sliding sled to ensure exact frame lengths - I needed 18 drawers/doors to make. This helped tremendously. 4) When using the slot cutter (larger 8781 frames only) make sure you give yourself a little play in the cut else your finished frames might not have exactly flush corners. I ordered the 8781 bit. I set it up in my router table and ran my cherry stock thru it. When the bearing contacted my stock on the final pass, the top flute was still flat on top. I determined that the bottom of the cutter for the top flute was still behind the bearing. The only way to remedy this was to remove the bearing and use the fence to adjust the depth. Fortunately, my fence is adjustable in .001" increments. Another tip, make sure the collet on your router has no sawdust in the grooves. If it does, it will not grip this bit tight enough and it will "lever" up during cutting. I ruined 2 pieces of cherry until I discovered this. It is as easy as it looks in the video makes very nice frame. I was worried about biscuit joint. I had never messed with biscuits very strong, surprising strong and fast. My other big worry was cup hinges description calls for 1 in thick stock, I used 3/4 in thick scrap drilled 1/2in deep and had plenty of room perfect. I got item 8781. Don't think, just buy it. "I love your router bits. Made this entire kitchen from scratch." 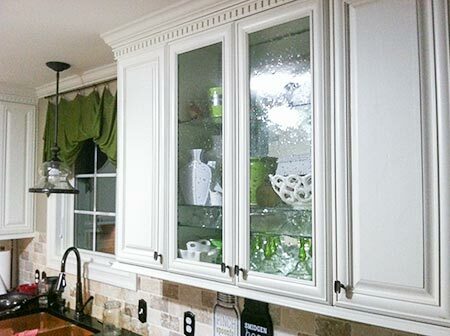 We received an email sent from a customer with these shots of a kitchen he made using MLCS Mitered Drawer Frame #8778, Katana Mitered Door Frame #18781, #18698 Ogee Raised Panel Undercutter router bits, and #9012 Merle Clamp. 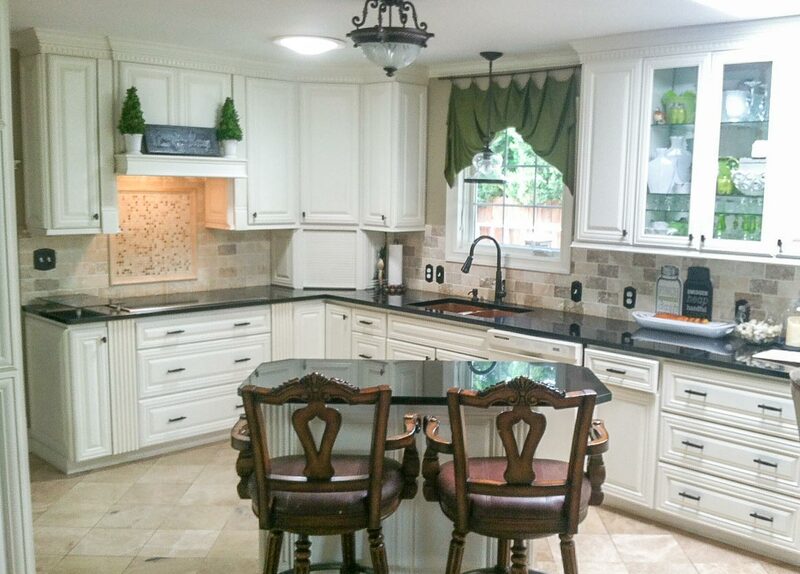 Congratulations on your beautiful kitchen Paxton! 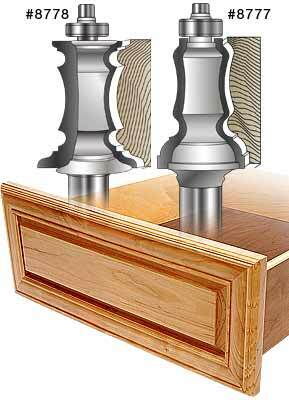 You've demonstrated the possibilities of our Mitered Door Frame and Raised Panel router bits. SAVE $23! Choice of 5 profiles! 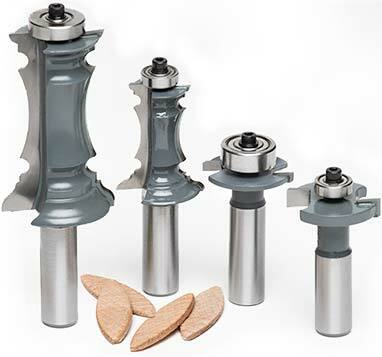 Includes one carbide tipped 1/2" shank Mitered Door Frame bit, one Mitered Drawer Frame bit, 1/4" Slot Cutter bit, 1/8" Slot Cutter bit for #H‑9 biscuits, and 100 #H‑9 biscuits. For starters they're truly beautiful. The # 8781 with the #8778 combo I got with. It really makes the door just lovely. I enjoy using my router with this set though making a couple mods to it which was no bit deal at all I have fun doing this door profile. The "KEY" thing that must be done with this set and any set for what I can see is this. You should give yourself at least 1/2 to 1" full inch of extra board but the wider the better that way when you route out the profiles the bearing rides along the wood and the rest of the wood stock rides perfectly flat. This in turn creates a perfect profile to which if you use the biscuits cut them in having the stock face down. When you do stock face down you're referrancing everything from that point and if you're off some place you'll be able to sand the back to create appealing panels without any worries. 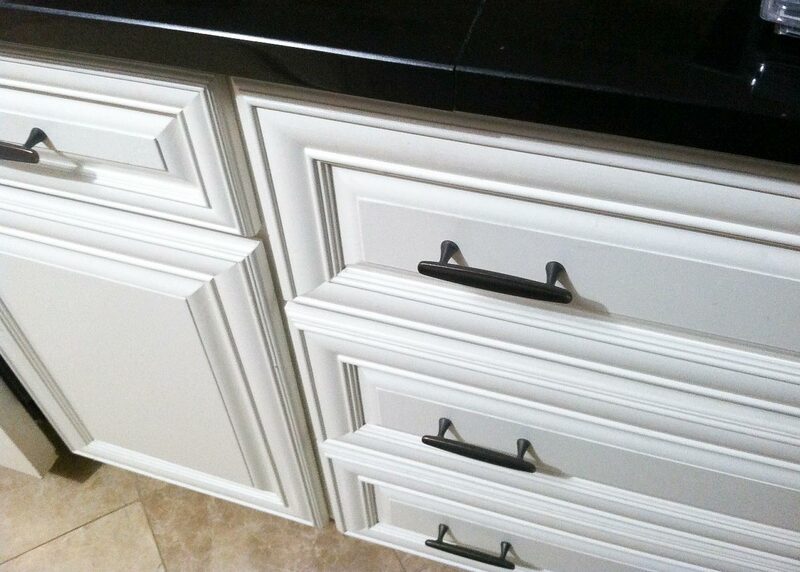 The biscuit cutter works awesome for the door profile but not so much for the drawer profile. Was going to try it but there's not enough meat unless you add your fingers to the equation to be able to satisfy the use of the biscuits. I have a CMT tounge and groove router bit set that are matching height to which I used while goofing off and that worked the best for the smaller profiled drawer set. If I had the extra money I'd buy all of the sets just to have and enjoy creating saw dust but I don't right now and I hope that they come up with some matching sets to complement the other sets of door profiles for the drawer profiles. Cause of the biscuit situation of the smaller profile I give it a 4.7 but everything else is perfect. Can't wait to spend more money trying the other bits out when given the chance. Maybe they could send me a set of each for a trial run as the one I cut with now cuts every wood I put threw it clean as a whistle. I just used this set as shown on the video and the details it leaves on the wood is beautiful. I bought the #8362 two months ago; I was a little weary on how the stock would look after it was run. But I was very pleased with it. I would recommend it to anyone. I like the look of mitered doors and being able to make my own stock is nice, also $80 is a good price for the set. I got the #8351 Mitered Door Frame Router Bit Kit 2 after MLCS introduced them. (I made the suggestion via email, they responded!). HUGE Kudos for MLCS for offering it with the profile I needed... Anyway, I recently finally broke them out of the box and put them to use. The bits cut laser sharp and smooth, no rework needed at all. The carbide on them is seriously thick, and the bearings top notch. I own several other MLCS bits, templates, etc... I will keep coming back. I am very happy with the product, and even happier with the customer service! If you are a hobby woodworker, or just trying to save some serious bucks by doing your own remodeling, this set makes your work look absolutely professional! These bits make excellent raised panel door frames! I am also using the bits for 2 1/2 inch high moldings and am very happy with the results. Mitered Drawer Frame Kits Above! These smaller sized, 2 flute, carbide tipped bits are the perfect complement to Mitered Door Frame bits. They can be used to make matching profile drawer frames or to make smaller sized doors, using 1-1/2" wide stock. 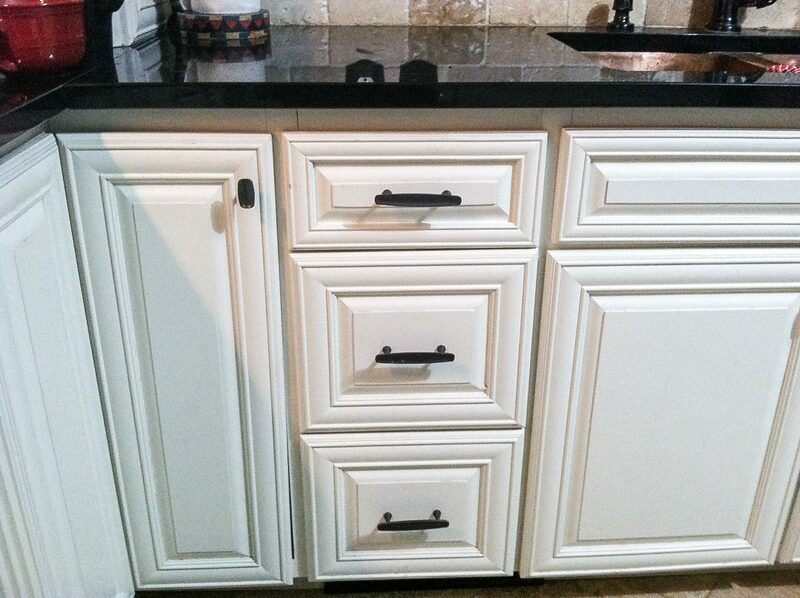 See Mitered Door and Drawer Frame Kits. See Peel & Stick Felt Box Liners. 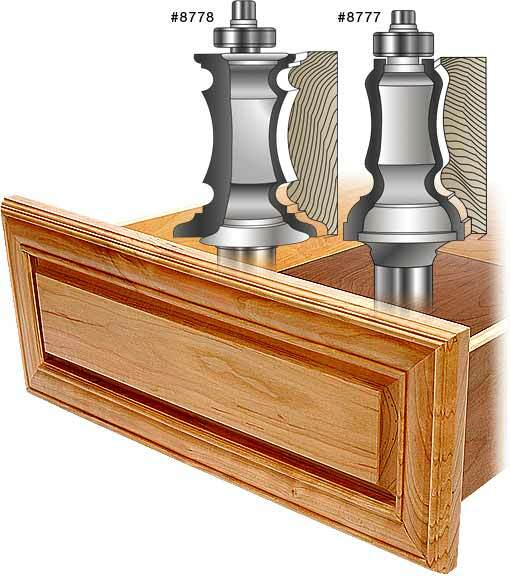 I built three kitchens using this router bit set with the clamps as shown in the video and I get so many compliments about how beautiful the doors and drawers are. I used these router bits to remake my master bathroom cabinets - eighteen door and drawer fronts. The finished product was excellent. I also made two large picture frames for surround the mirrors. They accented the drawer/door fronts making the bathroom exceptional. I would recommend these bits to everyone. Just make sure you follow the tips on the MLCS videos in addition to making the last several passes at 1/16th inch or less intervals. Guess I can write a review to this here as well though saying most if not everything on the other review I put forth for the door profile I got. First and fore most this bit truly is the mini-me's of it's daddy. It cuts so nice and clean like the other one I got of the set I purchased that if I had the money I'd buy all of the bits shown for mitered doors. Down side I guess would be that this bit here is the only one that matches cause of profile issues I'd imagine but who knows I'm sure they're trying hard to get something to look like the others in the works. Later on I plan on buying one of the other bits and will just make a flat panel or what ever I choose to do at that time. The biscuit cutter that goes with the set doesn't quite work well with the profile unless you make maybe a sacrafical fence for it and be careful doing it free hand but still the lack of width made me decide to use my CMT tounge and groove set for this profile. Make sure though what ever you use to lay the stock good side down to referance everything off of that way you can sand down the back and not worry about the profile being all messed up. 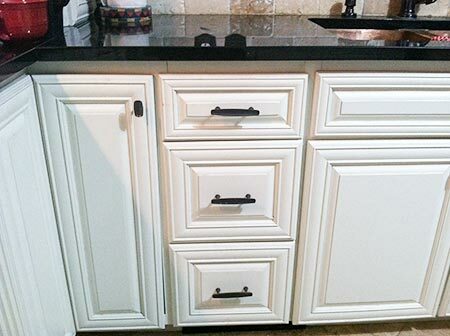 I give this a 4.7 like I stated before cause of the lack of a slot cutter to cut a good slot for the biscuits but otherwise I'll buy more when I can for the mitered door styles.